Aurora is a lady of mystery ~ it’s a mystery to us how such a sweet Siberian could find herself homeless and with our friends at the shelter. Aurora is estimated to be two to three years of age, and while we don’t know much about her past, we can tell she was well taken care of and obviously a cherished member of a family that surely must miss her. Sadly, they have not been found and we have welcomed Aurora into rescue until she finds a new family to call her own. Aurora is a social girl and would excel in a multi-dog household. However, she really enjoys one-on-one time with her human companions so she would also do well in a single dog home where she would get lots of love and attention. 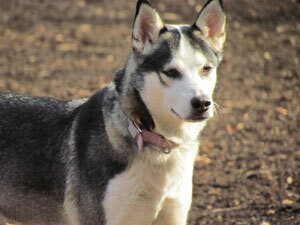 Aurora is at that perfect age ~ she is calm and reserved at home and has a ton of fun at the local dog park. If you are looking for a dog that is past the puppy stage but is still active to keep up with your pack, look no further ~ Aurora is your girl! !